Mor Spirit Hopes for More on Road to Kentucky Derby: In 2014, the Los Alamitos Futurity saw brilliance that was no flash in a pan. The top three finishers, Dortmund, Firing Line, and Mr. Z, all went on to win important stakes races. Dortmund and Firing Line even finished second and third in the 2015 Kentucky Derby behind the immortal American Pharoah. Michael Lund Petersen’s Mor Spirit and jockey Gary Stevens, right, outrun Toews On Ice (Martin Garcia), left, to win the Grade I, $350,000 Los Alamitos Futurity, Saturday, December 19, 2015 at Los Alamitos Race Course, Cypress CA. This year, the Los Alamitos Futurity was loaded with star potential, especially from the Baffert barn. Toews on Ice (ArchArchArch) was the slight favorite over his stablemate, Mor Spirit. However, it was the latter who got the best of the field, giving Baffert his eighth Los Alamitos Futurity, formerly called the CashCall Futurity hosted at Hollywood Park, and making him Los Alamitos’ all-time leading stakes-winning trainer. 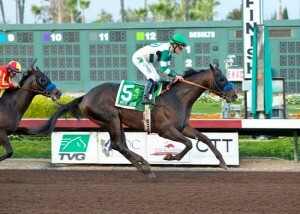 With Mor Spirit defeating Toews on Ice, it also gave Baffert a 1-2 finish. The son of Eskendereya has never finished worse than second in any of his four starts, collecting $288,400 to date. Mor Spirit was last seen finishing second in the muddy Grade II Kentucky Jockey Club Stakes behind Airoforce (Colonel John). The colt likes to settle off the lead and make his move in the stretch, running down his opponents. Mor Spirit has twice been offered at public auction, first bringing $85,000 as a yearling in the Fasig-Tipton Kentucky Fall 2014 Yearling Sale. 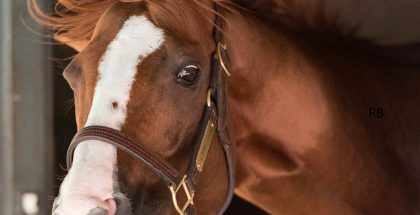 However, as a two-year-old, the colt had matured and brought $650,000 in the Fasig-Tipton Florida Select 2-Year-Olds in Training this year. The colt was purchased by Bernard Schiappa and Michael Petersen, and Mor Spirit is the first graded stakes winner for those owners. Mor Spirit is a son of Eskendereya, who was recently sold to Japanese interests but stood at Taylor Made upon his retirement following an injury sustained before the Kentucky Derby. However, as a three-year-old, Eskendereya was undefeated until that injury was reason enough to retire him. Eskendereya stood for $17,500 in 2015. 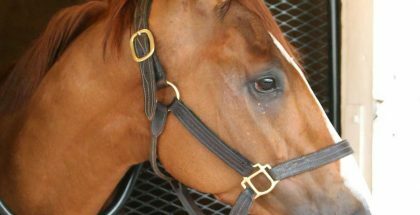 His most notable offspring are Eskenformoney, a multiple graded stakes placed filly, and Isabella Sings, a multiple stakes winner on turf, including a Grade II in her most recent start. Mor Spirit is out of the Dixie Union mare I’m a Dixie Girl, who has not produced much in the ways of notable offspring. Mor Spirit has six half or full siblings, but none have made much noise in the racing world. However, I’m a Dixie Girl was mildly successful as a racehorse. She was a stakes winner and placed in the Grade III Astarita Stakes at Belmont Park as a two-year-old, but she never won a race that was longer that six furlongs. Her sire Dixie Union was also a Grade I-winning sprinter his entire career, making his final start in the seven-furlong Malibu Stakes. However, Dixie Union was able to sire horses who could handle some distance, such as Overanalyze, who won the Arkansas Derby at nine furlongs. His influence is ranging from sprinters to route runners. Mor Spirit earned 10 points towards a potential start in the 2016 Kentucky Derby, which makes a total amount of 14 that the ridgling has earned. Baffert and Gary Stevens are aiming for another Kentucky Derby with this colt and will likely freshen him up and bring him back to Santa Anita in the early spring. “I’m super excited about this colt. He’s already progressed since his maiden breaker, and he’s going to just get better and better as the distance progresses,” Stevens said. Gary Stevens won his last Kentucky Derby in 1997 with Silver Charm. Since then, Gary won other major stakes, retired in 2005, and then launched a comeback in 2013 which resulted in a win in the Preakness Stakes aboard Oxbow and a Breeders’ Cup Classic win aboard Mucho Macho Man.